Residents of the Tymber Skan condos in Orlando received a notice in August that their cable and Internet service would be cut off on Sept. 21. Following the armed robbery of a repair tech, a cable and Internet provider has decided to stop serving an entire Orlando condo complex, potentially leaving residents without any affordable way to get online. 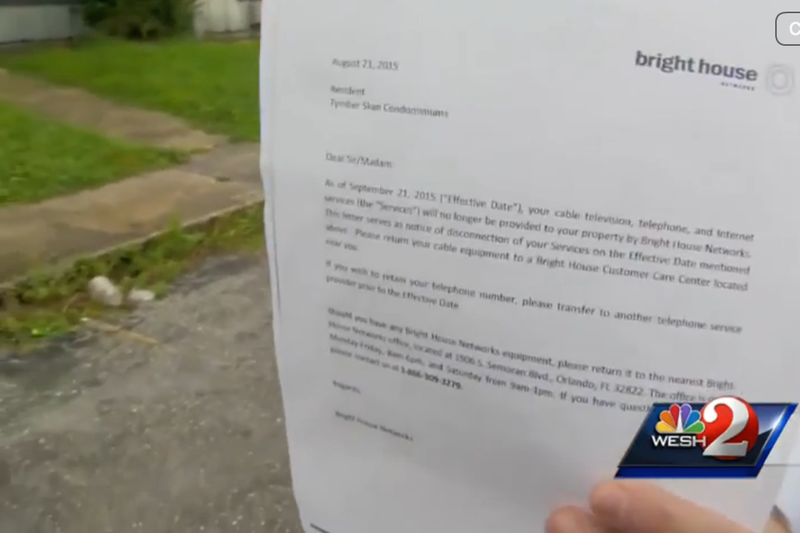 Last week, Florida-based Bright House Networks told the residents of the Tymber Skan condominiums on Orlando’s Lake Catherine that crime in the area had reached the point where the company felt it could no longer offer service. This condo complex of around 60 units has seen better days. The Sentinel reports that it’s been fined more than $20 million by Orange County for various code violations. Nine buildings have already been demolished with more to go. One resident who has been the public face of the story is a disabled 54-year-old who works from home and says that Bright House’s decision to end service has put her in a bind. “Loss of income, loss of entertainment, I don’t know about you, but I prefer not to stare at four walls all day,” she told WESH-TV. She says she relies on the Internet for her income and that she can’t afford to move. Bright House was scheduled to meet with Orange County Sheriff’s Office reps on Friday and service was slated to end yesterday. We’ve written to the company for an update but have not yet heard back.